Summer has finally arrived in New England. And after the punishing Great Snow of 2015, no one is happier about that fact than we are. As the snow has melted, we’ve eagerly looked forward to each and every sign that the sun is returning. One milestone that loudly proclaims that summer is here in New England is the arrival of fresh, wild mussels! You’ll find bags of mussels in the grocery store almost all year round, but when you want the greatest tasting mussels on this planet, you head for mussels grown in the cold waters off Prince Edward Island. One way to score these succulent mollusks is through your local fish share. Don’t have a local fish share? Well, check out our friends at Cape Ann Fresh Catch! You’ll get the freshest local fish straight off the fishing boats in Gloucester…and every once in awhile they have some special offerings like mussels from Prince Edward Island! Last week, we eagerly stopped by the pickup point to get our 3 lbs of Prince Edward Island mussels and then ran home to start making dinner. And what better thing to pair with one of the greatest seafoods in New England? One of the greatest local wines, of course! 1) Melt butter in a large stock pot over medium heat. Add garlic and let sizzle for about 30 seconds. Season with red pepper flakes and lemon zest, stirring for about 45 seconds. 2) Quickly pour in wine into the pan and season with black pepper. Bring sauce to a boil, stir in mussels, and cover immediately. Shake pot and let boil for 1 minute. 3) Stir mussels, replace cover, and let boil for 2 more minutes. The shells will begin to open. Stir in the parsley, cover pot, and cook until all shells are open, 1 to 3 minutes. 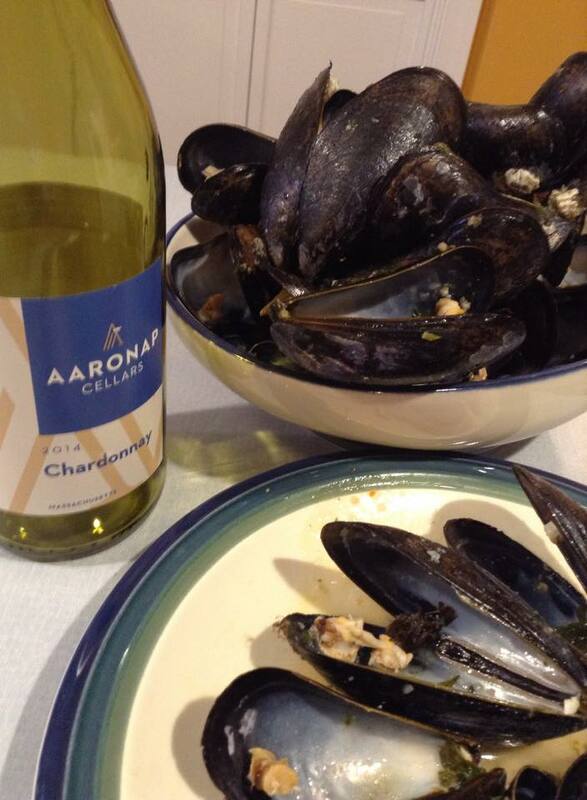 4) Serve with grilled bread (we suggest a Blond Loaf from Purple Carrot Artisanal Bakery) and lemon wedges…..and a glass of Aaronap Cellars 2014 Chardonnay! Now, most wine & food pairing blog posts feature a lovely picture of the wine beside the plated entree. Well, we were s0 hungry that all we have to share is the remains of one of the most fabulous meals we’ve had in recent memory…. Yes, the pairing of the mussels with the wine were so good, that all we have to show for it is a bowl and plate of empty mussels shells beside an empty bottle of wine. The floral & citrus aromas and minerality of the wine were a perfect pairing with the earthiness & brineness of the mussels. Be sure to grab some mussels and try this for yourself!